The warming climate that helped trigger B.C. 's mountain pine beetle outbreak might also be helping the province's forests recover, according to a new study. The warming climate that helped trigger B.C. 's mountain pine beetle outbreak might also be helping the province's forests recover, according to new research led by federal government scientists in Victoria. That's because B.C. forests are responding to climate change by growing faster, said the lead author of the study published in Geophysical Research Letters. "Since we are putting more CO2 into the atmosphere and things are getting warmer, trees are responding to that," said lead author Vivek Arora, a climate modeller with Environment and Climate Change Canada. The study says B.C. forests are regaining their status as "carbon sinks" — something the mountain pine beetle wiped out along with 18 million hectares of lodgepole pine. "This turn-around will happen much sooner than we imagined," said Arora. Normally, forests function as "carbon sinks," absorbing CO2 from the atmosphere, and helping buffer us from the impacts of rising greenhouse gas emissions. 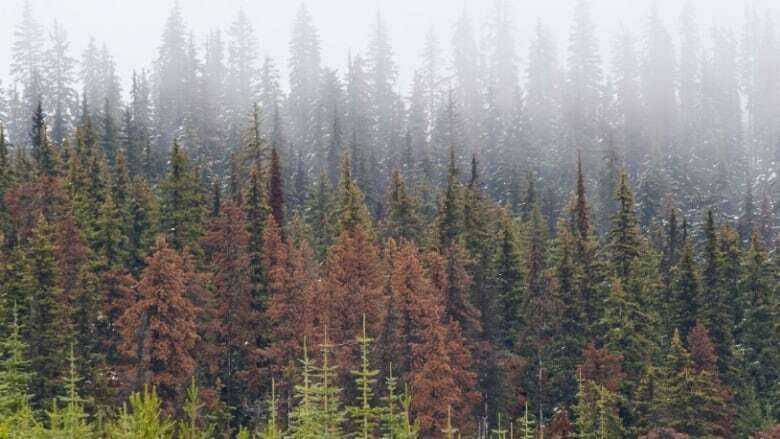 But, after the mountain pine beetle epidemic exploded in 1999 — eventually affecting an area of forest five times the size of Vancouver Island — all those dead and rotting trees temporarily made B.C. forests "carbon sources" that emitted more greenhouse gasses than they absorbed. THE NATURE OF THINGS: Beetle Destruction in B.C. By 2020, the study forecasts the balance will have shifted back, with extra wood growth due to climate change more than making up for the emissions caused by pine beetle kill. "Even by 2020, it means the positive effects of climate change more than compensate for the negative impact of the pine beetle outbreak," said Arora, who led the study with a team of researchers at the Pacific Institute for Climate Solutions, at the University of Victoria. To be clear, the study authors are not suggesting climate change itself is positive. But Arora says it is helpful for forest managers and others to know how B.C. trees are responding. "Climate change is, of course, not good," he said. "Overall, CO2 is still going up. [But] trees and oceans are helping, to buffer us from that effect." While the B.C. climate is expected to be warmer and wetter overall — which helps tree growth in temperate forests — summers are also expected to be drier, meaning more forest fires which add to greenhouse gas emissions, said Arora. However, the increased growth is still expected to outpace the loss to fires, he said. The study is based on a combination of historical observation and computer modelling, and like all models has limitations in terms of how closely it can approximate a system as complex as B.C. 's forests, says Arora. For example, another massive insect infestation — which is also expected to happen more frequently under climate change — could again wipe out vast swaths of forest, and that's not accounted for in the model, he says.